Venus and the Moon are engaging in their dance the next few months in the evening sky. Tonight the crescent Moon was well below Venus. Tomorrow night the Moon will be below Venus and Thursday night it will be just above Venus giving two more excellent opportunities to see this nice pairing in the night sky. But that’s not all. Venus is nice and far away from the Sun right now which and the Moon provides a useful guide to help see Venus during the day. I recommend using a program like Stellarium to help you out. Set it up for your location and time of observation. Be sure the Moon and Venus are up in the sky during the day. 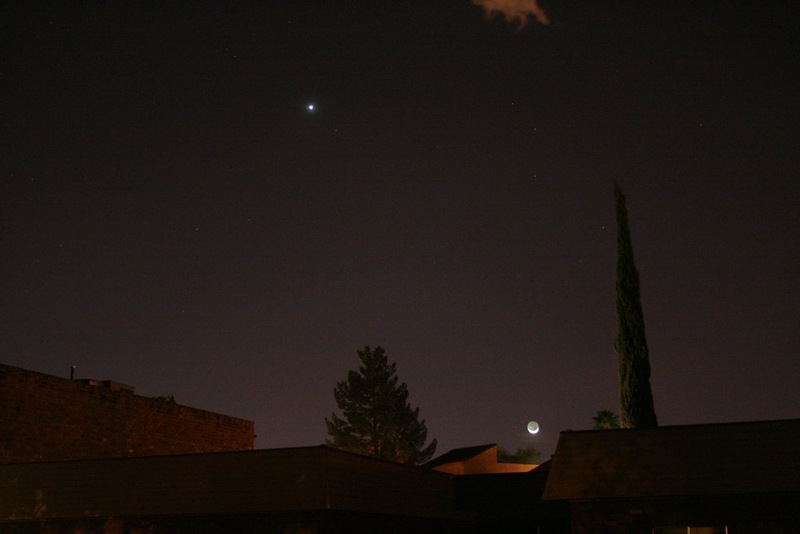 Note the position of Venus relative to the Moon. Now you are ready to track down Venus in broad daylight. Find the Moon and slowly scan away from the Moon toward where Venus should be located according to Stellarium. You really have to look directly at Venus to see it during the day. That is, the image of Venus must land on the fovea of your eye. The fovea is the small spot in the center of your retina where the cones are most closely spaced and your vision is most acute. Once you hit that spot, Venus will pop into view so prominently you will wonder how you missed it before. It takes some practice. Be sure your eyes are focused at infinity (focus on the Moon before you scan will do the trick). It also helps if you stand so the Sun is hidden Sun behind a tree or building to cut down on glare. Many people wait until close to sunset to try this, but I have seen Venus practically any time it is up, even in the middle of the day. A good strategy might be to try it near sunset on Wednesday night and if you are successful, try it during the day on Thursday.